With a serious cardiological problem such as his heart being 3 sizes too small it was understandable that The Grinch was a little cranky. However he finally came around and recognized that he was not alone in the world and wanted to dance and sing silly songs with all the Who's in Whoville after some corrective and invasive surgery. 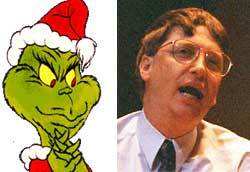 In a surprising (and welcome) move today, Bill Gates announced that his heart too had grown three sizes too big. Cindy Loo would be proud.